I’ve already made it a couple of times, and it’s really easy to make and it tastes very delicious! 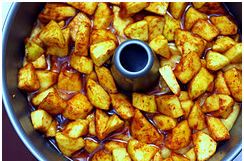 Mix the apple chunks with the cinnamon and sugar and set aside. Stir together flour, baking powder, salt and walnuts in a large mixing bowl. In an other bowl, whisk together oil, orange juice, sugar and vanilla. Mix all the ingredients, then add eggs, one at a time. Pour half of the dough into the tube pan. Spread half of the apples over it. Pour the remaining dough over the apples. Arrange the remaining apples on top. Bake for about 1 1/2 hours. Decorate the cake with whipped cream and walnuts. 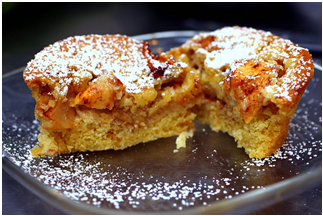 You can also learn how to make this cake with the help of our new game: Tessa’s apple cake!